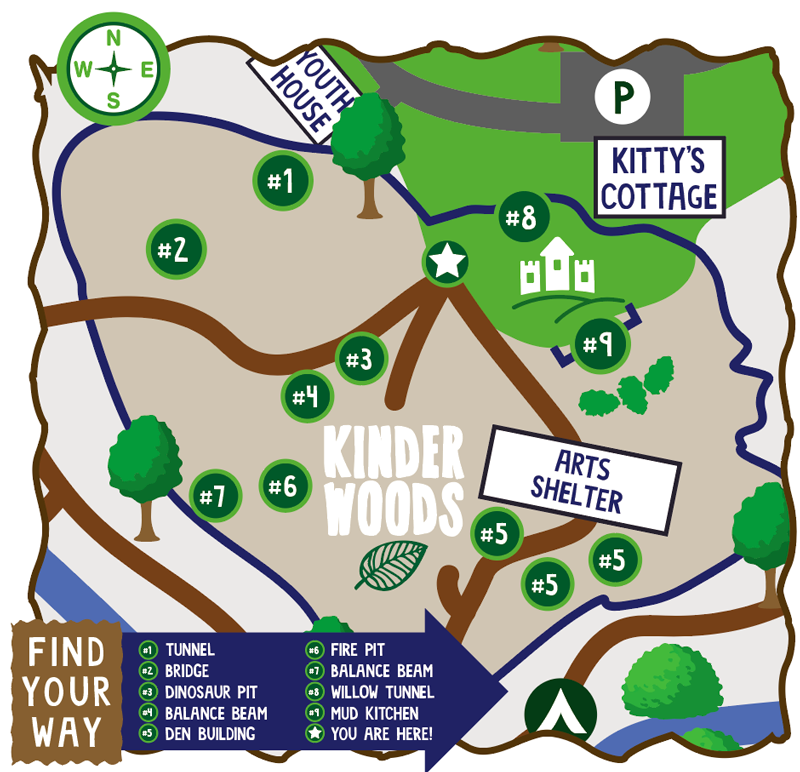 KinderWoods is a two acre section of open woods for unstructured, hands-on nature play. Within the perimeter of KinderWoods children, ages eight and younger, will find design elements that incorporate nature in ways that support children’s natural interests. The space is designed for child-led play that will foster opportunities for children to value their role as caretakers of nature, experience natural consequences, learn problem solving and discover childhood joy. It is letting children explore in their own way, to learn and to grow. Each child follows their own play patterns coded in their body and developing brain, whether they are deeply engrossed in their own world or when interacting and playing with other children. This type of play is extremely beneficial. It is a requirement for developing human beings to unfold as designed. Feeling safe is paramount for optimum learning. Each child has their own “readiness-meter” and it keeps them safe and comfortable to learn. Have patience as each child evaluates a new situation before engaging. Allow each child as much time as it takes for them to feel comfortable to engage in play. We ask that you sign in each time you visit KinderWoods. When signing in you are assuming risk and helping us capture usage information. This is important as we seek grants and donor support for KinderWoods. Thank you. Parents and guardians please open and always close gates behind you. Please sign in each time you arrive to KinderWoods. Please pick up after yourselves. Trash cans are available at this kiosk and at the shelter. Take the opportunity to teach responsibility and ask children to hang the shovels when finished with play. In the mud kitchen, we ask that you return the mud to the box, wash dishes and stack upside down so as to not collect standing water. A bathroom can be found by exiting the gate near the kiosk and following the fenceline to the left. KinderWoods is a fantastic choice for a special event. Please contact the office to confirm reservation dates. Reservations will reserve the shelter for your party’s use, and a staff member will be on site to prepare for and check in with your party as needed. The remainder of KinderWoods will be open for access to other guests. *Special events are defined as a gathering of 8 or more non-related children.